Ultra’s forthcoming festival in Beijing has been postponed after festival organisers failed to get the necessary permits in time. Both local authorities and permit issues are to blame which have forced the festival’s organisers to come up with a last-minute solution. Instead of a full-blown festival, Ultra has been forced to commandeered three clubs to hosting every DJ on the festival line-up across two nights. Unfortunately, festival goers will now be forced to choose two of the 6 events which have been shared via Ultra's social media. 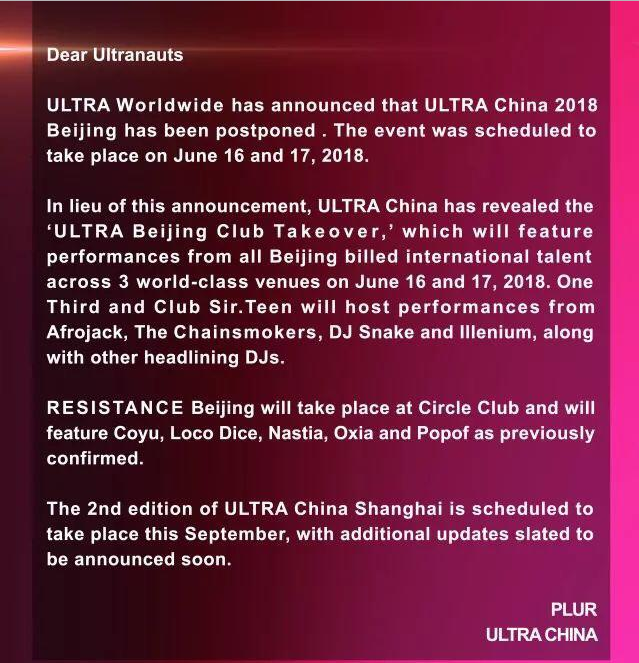 The clubs hosting Ultra’s hastily created ‘Ultra Beijing Clubs Takeover’ will be 1/3, Sir Teen and Circle. Rather worryingly, Ultra Worldwide is set to host another festival, Ultra Shanghai, later in the year, permits permitting, of course. Check out the new schedule below as well as an official statement from Ultra on the postponing. Follow us and visit: https://t.co/D8lLof65nU for more details and tickets!